From January 1 to December 31, 2018, a total of 365 alleged rhino poachers and 36 alleged rhino horn traffickers were arrested nationally. South Africa has recorded a decline in rhino poaching for the third consecutive year, environmental affairs minister Nomvula Mokonyane said today. She said significant progress had been made with the implementation of the Integrated Strategic Management of Rhinoceros plan, covering the period January 1 to December 31, 2018. “As a result, 2018 recorded a decrease in rhino poaching incidents to 769, making it the third consecutive year that South Africa has seen a decline in rhino poaching, particularly in the national parks. This is a decrease of 259 rhinos compared to 2017 when 1 028 rhinos were killed for their horns. It is also the first time in five years that the annual figure is under 1,000,” said Mokonyane in a statement today. 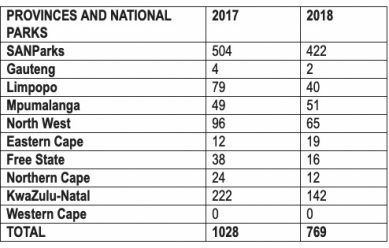 A breakdown of rhino poaching incidents for 2017/2018, as supplied by the department of environmental affairs. “The decline is not only indicative of the successful implementation of the Integrated Strategic Management of Rhinoceros Approach countrywide, but also a confirmation of the commitment and dedication of the men and women working at the coalface to save the species,” said Mokonyane. A total of 421 rhinos were poached in the Kruger National Park, 16.5% less than the 504 poached in 2017, and one was poached at the Marakhele National Park. From January 1 to December 31, 2018, a total of 365 alleged rhino poachers and 36 alleged rhino horn traffickers were arrested nationally. A total of 229 alleged poachers were arrested inside and adjacent to the Kruger National Park, 40 more than the 189 arrested in 2017. There are currently 318 rhino poaching-related cases on the court roll involving 645 accused and 897 charges. Of these cases, 275 are trial-ready. From January to December 2018, the National Prosecuting Authority (NPA) obtained convictions in 78 of the 82 cases that went to trial. This represents a 95.1% conviction rate. The 78 cases involved 135 accused, all of whom were convicted of rhino poaching and related matters. This translated into sentences of over 500 years’ imprisonment in respect of the guilty verdicts, said the minister. 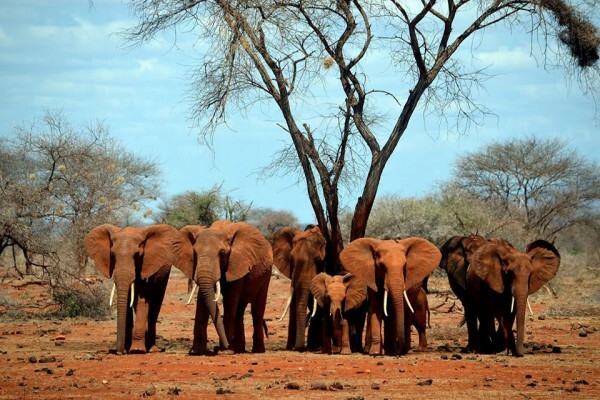 It was “regrettable” that elephant poaching was on the increase, she said. A total of 71 elephants were poached in the Kruger National Park between January 1 and December 31, 2018. “Specific risk areas have been identified and strategies to address the threat are being adapted and implemented. One elephant was killed in KwaZulu-Natal, which brings the total for South Africa to 72 elephants for 2018. South Africa continued to engage with countries where rhino horn seizures took place, said the minister, in order to request that samples of the horn DNA be sent home for analysis in line with the Convention on International Trade in Endangered Species (CITES) resolutions. Members of the public should report any suspicious activities around wildlife to the department’s environmental crime hotline on 0800 205 005 or contact the police on 10111.